Please note our organization’s new name: Colonial Virginia Holly Society (CVHS). 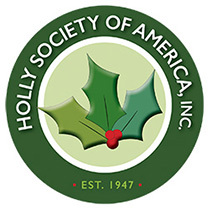 We continue to be affiliated with the Holly Society of America (HSA) who has established regions, replacing the chapters. CVHS is a member of the Mid-Atlantic Region of HSA. Terrific programs as we had in the past and for the upcoming meetings require lots of preparation. 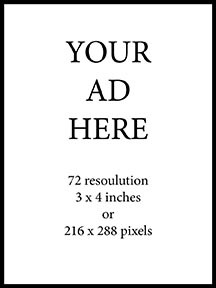 Please consider contributing to the planning, publicizing, or assisting at our meetings. Contact one of our officers listed on the last page to support our society. Save the date! CVHS fall meeting will be on October 27, 2018 at Virginia Institute of Marine Science (VIMS), Waterman’s Hall, at Gloucester Point, Virginia. This meeting will be a very informative meeting all about hollies. This is your chance to ask experts your specific questions regarding the care of hollies and incorporating them into your landscape and home garden. Everyone is encouraged to attend and bring some friends. Please consider bringing a donation to our outstanding auction of hollies and other plants. The proceeds from the auction supports our meetings and provides financial support for students attending Nature Camp. A registration form will be sent shortly to our membership. CVHS’s SPRING MEETING: A date will be determined and we will keep you informed. A reminder of the HSA annual meeting which will be in Cape Cod, MA. October 8-12, 2018. For more information about the meeting visit their website (www.hollysocam.org) or join them on Facebook, Holly Society of America. CVC has 49 memberships which includes 69 people. Membership for our organization is on a calendar year, January through December. If you have not already paid dues, please do so at the cost is $5.00 per year. Two persons at the same address may share a membership. Checks should be made to Colonial Virginia Chapter, even though our name has changed, and mailed to: Jane Dixon, 7628 Forbes Road, Gloucester, VA 23061. Be sure to include: your name, address, phone number and email address. Membership is a great value! Please tell your friends or consider providing a membership as a gift. Also, you will save $5.00 on the next meeting registration by becoming a member! The meeting on May 24, 2018 was the first Mid-Atlantic Regional meeting of the HSA held at the United States National Arboretum (USNA) in Washington, D.C. The following summary includes information from the Holly Society Journal, Volume 36 Number 1 2018 article Mid-Atlantic Region Report by Sue Hunter. The Arboretum was established in 1927 by an Act of Congress and is administered by the U.S. Department of Agriculture’s Research Service. There are 446 acres with 9.5 miles of winding roadways with over 600,000 annual visitation. With 71 staff and over 171 volunteers they conduct research, develop and maintain gardens, conduct education programs, write scientific articles, conduct plant introductions, are part of cooperative programs and international cooperation and have a herbarium. 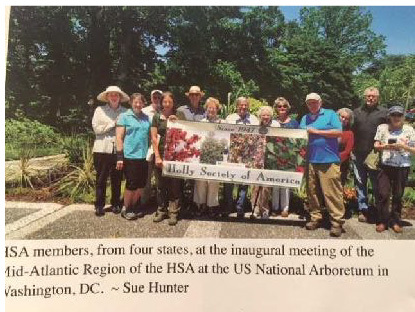 Participants from four states attended and were welcomed by Sue Hunter, HSA President, at the USNA Arboretum Classroom. Sue asked each of us to introduce ourselves and state why we are interested in hollies. Answers to why we are interested in hollies range from not really liking hollies but a holly enthusiast talked them into learning more about hollies, to being introduced to hollies by friends, to indicating they are plant people and enjoy the exchange of information. 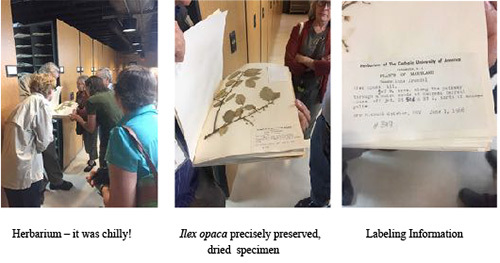 Carole Bordelon, Supervisory Horticulturist and Curator of the Arboretum’s Magnolia and Ilex Collections, also welcomed us and after a brief presentation split us into groups to tour the Arboretum’s Herbarium and Plant Records. Thanks to Carole, Stefan Lura, Botanist, and Alan T. Whittemore, Botanist, for providing information during tours and hosting our group. The Herbarium was founded in 1848 and holds over 5 million pressed and preserved specimens from around the world. The drying technique was first used in Italy in the 1500s. It is one of the top ten largest herbariums in the world, and one of very few that included wild-collected specimen in addition to cultivated specimens. 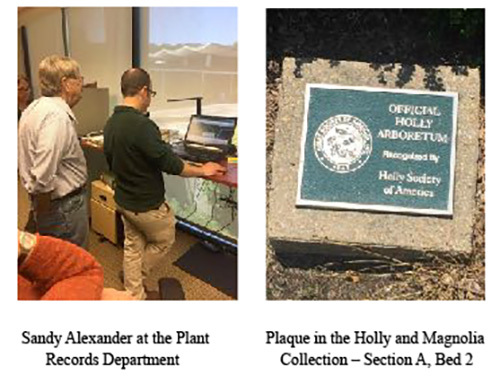 HSA serves as the International Registration Authority for cultivated Ilex and works closely with Arboretum staff to ensure the botanical descriptions are accurate and the live specimens are preserved in a timely fashion. Upon descending into the secure, subtly-lit, climate controlled area of the herbarium, we saw aisle after aisle of precisely preserved, dried specimens, some being 150 years old. Labeling information includes geographical location, date, collector, and other relevant information. Some specimens which provide an historical record were collected from natural areas that don’t exist anymore due to development. The Plant Records department has original designs and maps of the plant collections at the Arboretum. A staggering amount of hand written information from researchers is being updated and preserved in a new database which will allow easier access to the plant information. After lunch, attendees participated in a self-guided tour of the Holly and Magnolia collections on the grounds. According to Arboretum staff, the best mulch for hollies and magnolias is wood chips and grass cuttings. The U.S. National Arboretum app can be download through an app store. It includes detailed tours and maps of the grounds and special exhibit information. Also staff are very grateful for the current volunteers but could always use more help. If possible, please consider volunteering to work on the gardens or provide support updating the database. Thanks to Ross Cromwell for providing some of the pictures and content included in this issue.